Use a semi-homemade secret ingredient to make this bite-sized, delicious Crazy-Easy Cheesy Potato Recipe the kids will LOVE! Spray mini muffin pan with canola cooking spray. Prepare the potatoes according to package directions. Mix the eggs, mozzarella cheese, and green onions into the mashed potatoes until well combined. 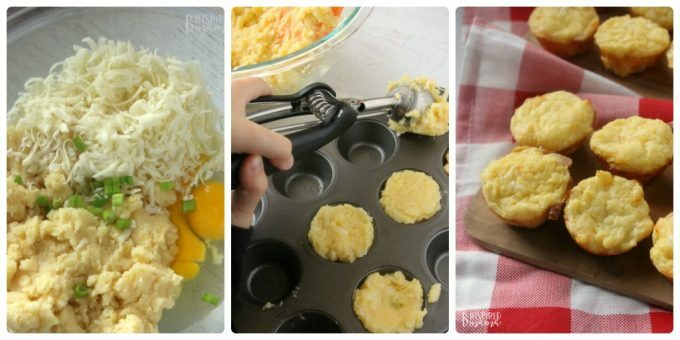 Using a cookie scoop (or a tablespoon) fill each muffin cup in the pan with cheesy potato mixture. Bake 15-18 minutes until tops of potato bites are slightly golden brown. Cool for one minute in the pan before removing.